Half Moon Bay is one of the best snorkeling spots on the Riviera Maya. The water level is relatively low which is great for visibility. The coral is healthy and plentiful and visitors should be careful to not disrupt or damage it. For those not staying in Half Moon Bay, the preferred place to start is at La Buena Vida, located between "The Wasteland" and the "Gorgon Forest". We have divided Half Moon Bay into eleven sections. Each of these sections are described below. WADING POOL: Water is usually 1-2 feet deep with rocky bottom with lot of seagrass and other algae. Visibility was from mediocre to nil. Fish were mostly gobies although juveniles and the occasional trunkfish could be spotted. The two turtles we saw there were youngsters (<1 ft) zipping around. HIGH PLAINS: Mostly rocks, sand and silt with some algae and lots of urchins. Depth gradually increases up to the deep. A fair amount of waves since this section is not protected by reefs. Not many fish but a good place to look for urchin shells. Visibility can be good to mediocre. THE DEEP: Mostly silt with a few algae. Depth is 10-20 feet. Not much to see although I did meet my biggest turtle there (a 4.5 ft loggerhead). There is also the occasional barracuda. A good option to go from one end of the bay to the other since waves are not as strong as in the High Plains. Visibility usually good. GORGON FOREST: Lots of soft arborescent coral and the occasional brain coral on a mostly sand/silt bottom. Low number of fish but we mostly go there for the coral and the conch shells. Most of the shells already have inhabitants (hermit crabs), so do not pick them up. THE LABYRINTH: A very well deserved name. Lots of hard coral and reef leaving corridors you can swim through. Extreme caution must be used so that the coral (and your skin) are left intact. Moderate amounts of fish with large number hiding under the reef. Visibility is usually very good to good. One of our favorite spots. SOUTH WALL: Impassable reef wall with a lot of waves. Stay away. THE WASTELAND: Silt bottom with strong current. Nothing much to see even though visibility is usually very good. TURTLE CITY: Name says it all. A relatively boring mixture of rocks, sand, silt and sea grass with a few coral islands. Visibility is usually passable to very poor. However, this is where the turtles hang out since over half of our turtle sightings were in this section. We almost always began and ended our dives in there. CORAL ISLANDS: The junction between this section and Turtle City is a sudden rise in the sea bed leading to pretty rough waves. That is where squid and a good amount of fish like to hang out. If you can take the action, you won't regret it. Just hang on to your mask. This section consists of islands of hard and soft coral where big brain corals are evenly interspaced for a thoroughly enjoyable snorkeling experience. Highest density of fish is found here including large schools of blue tangs and surgeonfish. Visibility usually very good. Our favorite spot overall. SPONGE GARDEN: Mostly sandy bottom with some coral islands. Very good visibility. Most of the sandy patches are covered with low lying yellow coral or sponges. Best spot to see rays. NORTH WALL: Impassable reef wall with heavy waves. Again, more prudent to stay away. However, we have been able to explore it on a particularly calm day at high tide. Very beautiful. Have seen three turtles in one visit. 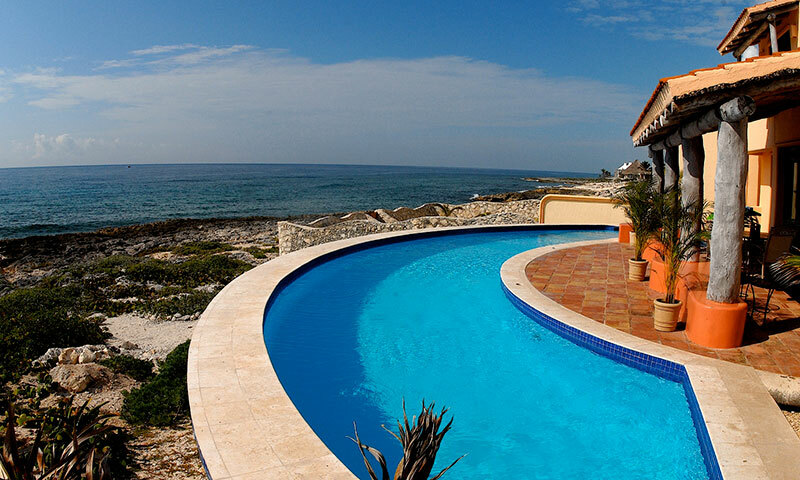 View a collection of villa and condominiums for rent on Half Moon Bay, Akumal.